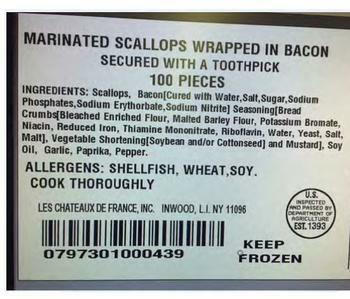 Les Chateaux De France of Inwood, N.Y., is recalling approximately 4,225 pounds of bacon-wrapped scallops. The product contain milk, an allergen not declared on the label. There are no confirmed reports of adverse reactions. The recalled product, bearing establishment number “EST. 1393” inside the USDA mark of inspection, was shipped to institutional locations in Delaware, Florida, New Jersey, New York and Pennsylvania. Customers who purchased the recalled should not consume them, but throw them away or return then to the place of purchase. Consumers with question may contact Jerry Shapiro at (516) 239-6795 or by email at sales@leschateauxinfo.com.